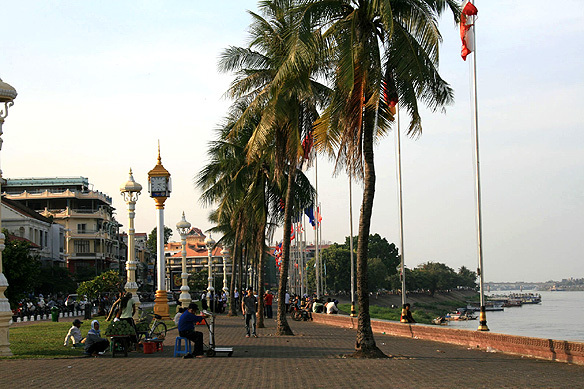 Phnom Penh is where the Cambodians live, work, play and pray. Its attractions are low key, forming part of the fabric of local life. The city sits at the confluence of the three great rivers of Indochina—the Mekong, Tonle Sap and the Bassac—and is the country’s commercial and political capital. It is crowded, chaotic and most importantly necessary in order to understand the everyday real Cambodia. The city’s most important and popular cultural site is undoubtedly its Royal Palace and Silver Pagoda near the riverfront. Visitors are only allowed to visit the Pagoda and its compound. Photography is not permitted within the Pagoda itself. 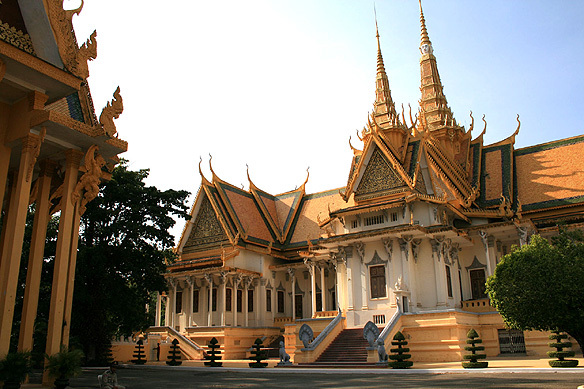 The Royal Palace was built in 1866 under the French Protectorate and King Norodom. Many of the buildings in the complex were added over the following decades. The Silver Pagoda, so named because its floor is covered with over 5,000 silver tiles weighing 1kg each, is also known as Wat Preah Keo or Pagoda of the Emerald Buddha. The Pagoda was preserved by the Khmer Rouge to demonstrate to the international community its concern for the conservation of Cambodia’s cultural riches. Although around 60 percent of the Pagoda’s contents were destroyed under Pol Pot, what remains is still spectacular. The Emerald Buddha, said to be made of Baccarat crystal, sits on a gilt pedestal high atop the dais inside. 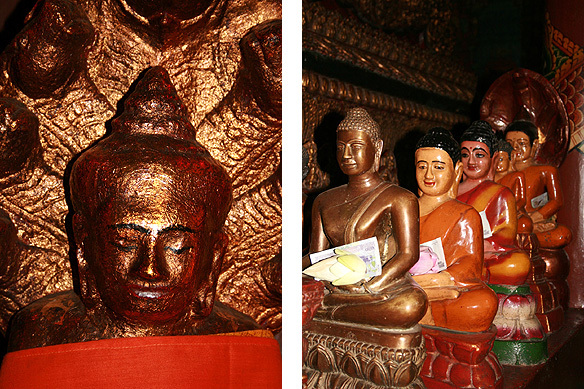 In front of the dais stands a life-size gold Buddha decorated with 9,584 diamonds, the largest of which weighs 25 carats. Made in the palace workshops in 1907, the effigy weighs 90kg. 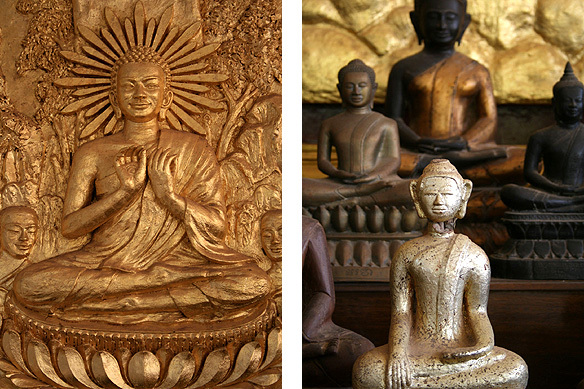 The whole hall is further filled with countless statues and figurines of Buddha in gold and silver, their smiling serene faces echoing and reflecting each other. The sacredness within the walls literally tangible. Today was my last afternoon in Phnom Penh and I felt like a local. I know the roads by now, how to haggle with the tuk-tuk drivers, and carry our Khmer prayer rituals at the wats. Why is it that just when a place starts to feel like home, it is time to leave? I’m not saying I love Phnom Penh or that it is the most beautiful city in the world. But it is now familiar and understandable, and thus dear. The chaotic traffic, the garbage heaps, young couples holding hands by the riverside as they gaze into their dreams, youth playing local games in the open spaces, vendors selling dead green chicks still in their shells, and prayers being offered to the gods at every corner and street. I spent much of my last afternoon at the National Museum. It is a beautiful place. Calm and serene. 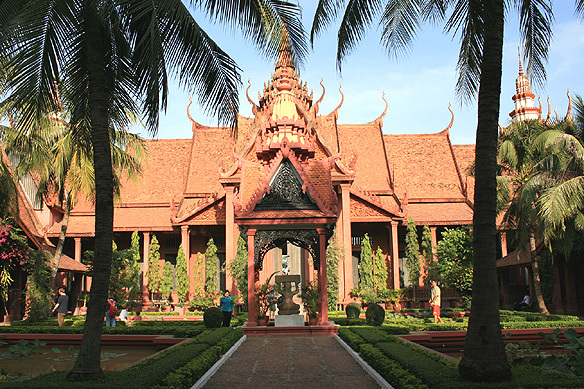 The red-roofed terra-cotta structure in traditional design (built in 1917-1920) is home to the world’s finest collection of Khmer sculpture and comprises four courtyards facing a garden. Over 5,000 objects are on display including a number of Angkor era statues. What is really touching about the Museum is that it feels sanctified, and is even treated by the locals as sacrosanct. Incense sticks and flowers stand sentinel in front of most effigies, while museum visitors bow and pray to them. Kneeling in front of these art works seems to be the most natural thing to do. 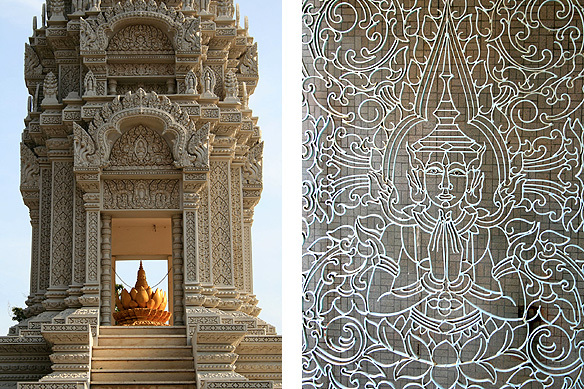 These effigies have been worshipped for centuries by the Cambodians. Being brought into a museum had not lessened their divinity. My favorites include the stunningly beautiful eight armed statue of Vishnu (6th or 7th Century AD), a statue of Buddha (6th Century AD) and the meditative seated figure of Jayavarman VII (12 Century AD). In a little annex, scores of Buddhas fill a room with a prayer mat in front of them. It seemed sacrilege to just pass by without offering a prayer to them too. After spending hours strolling amidst the sculptures at the Museum I wandered off to Wat Phnom where I wanted to pray in Khmer style for the last time. And ended up laughing and joking with the children thronging the courtyards, alternately begging and playing games amongst themselves. 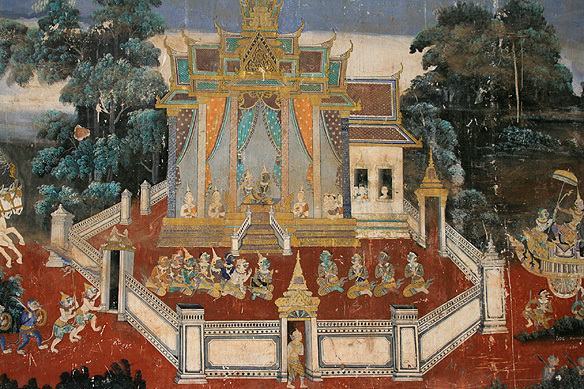 Wat Phnom is where the Khmers prefer to pray for luck and has a charming story associated with it. Legend has it that the city of Phnom Penh was founded when an old woman named Penh came upon four Buddha statues that had come to rest on the banks of the Mekong river. She housed these effigies on a nearby hill and the town that grew up here came to be known as Phnom Penh (Hill of Penh). The current temple was last rebuilt in 1926. The steps of the Wat are lined with land mine victims with amputated arms and legs. It is a gut wrenching sight. 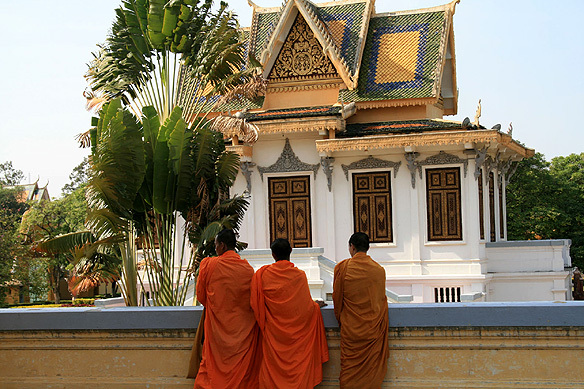 As one files past them to pray at the vihara (temple sanctuary), one asks oneself, “to whom?” But then that is Cambodia. Infinite suffering with infinite faith. Without questions. Without any questions at all. Came evening and I dropped into one of the deep leather sofas at the FCC facing the riverfront. The FCC or Foreign Correspondents Club is a delightful place and I guess could be defined as the most “happening” place in Phnom Penh! The F as expats like to call it, is housed in a grand old colonial era building and its open balconies have the most gorgeous views of the Tonle Sap and Mekong rivers. Two weeks had just sped by. Yet it felt like such a long time. These past 14 days had been a completely different experience from any of my previous travels. The poverty, the pain, the simplicity of the people, the gloriousness of their art, the profoundness of their faith … and therefrom the realization that life was not measured by its tears, but by the moments our souls soar and touch the skies instead. 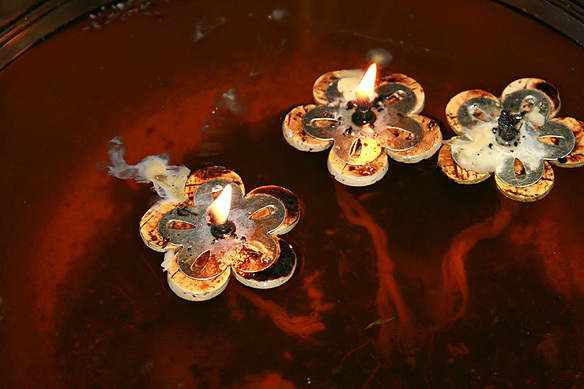 This entry was posted in Cambodia, Exploring our World and tagged Buddhism, Cambodia, Foreign Correspondents Club, Khmer Empire, Khmer Rouge, Khmer Sculpture, Mekong River, National Museum, Pagoda of the Emerald Buddha, Phnom Penh, Royal Palace, Silver Pagoda, Things to see in Cambodia, Tonle Sap River, Wat Phnom by Rama Arya. Bookmark the permalink. what a beautiful place to visit . Great pictures and description from the land of Buddha. Thank you Yogi Saraswat for stopping by and commenting. Appreciated. 🙂 Cambodia is a beautiful country which warrants a visit at least once in a lifetime.